On Saturday afternoon, I was thrown a bridal shower by my bridesmaids, my mom, and my soon to be mother-in-law. It was the best afternoon I've had in a long time. The games, the decorations, the food, the drinks, the laughs, the ladies... every second of it was amazing. You'll get a look at some of the pictures in Wednesday's post. 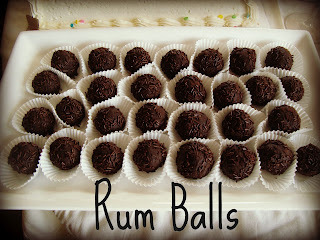 My friend (and bridesmaid) Marion made rum balls. She made them for my other friends' Stag & Doe and I ate way more than was appropriate for one person. When I saw them on the table I got very excited. 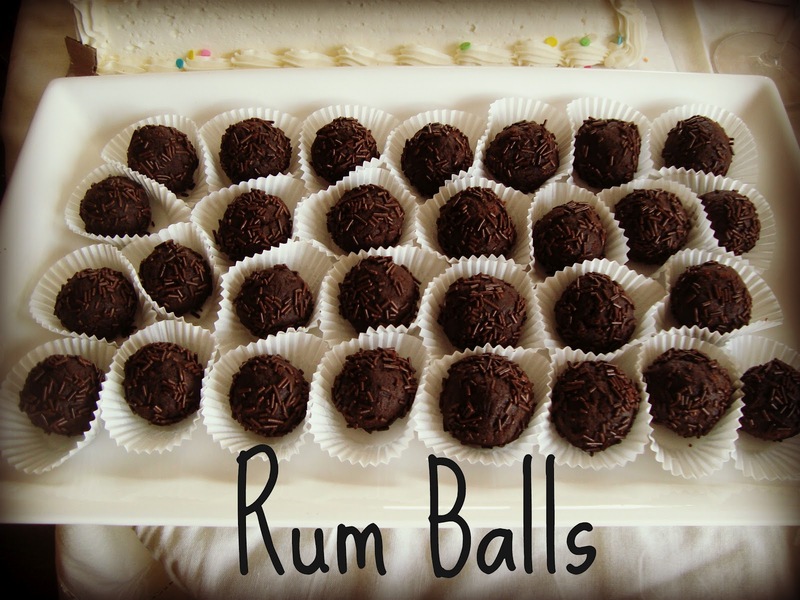 These rum balls are to die for AND they're a Martha recipe! I looked them up on the website, so here is the recipe I found (the picture looks very similar to the real things so I assume this is the correct recipe). Preheat oven to 350. Coat a 12-by-17-inch rimmed baking sheet with cooking spray; set aside. Melt 3/4 cup butter and 6 ounces semi-sweet chocolate in a small heatproof bowl set over a pan of simmering water, stirring occasionally. Set aside. Whisk together 3 eggs, 1/2 cup brown sugar, 1 tsp vanilla, and 1/2 tsp salt in a large bowl. Stir in chocolate mixture, then fold in flour. Pour batter into prepared baking sheet. Spread evenly with a rubber spatula. Bake until top is shiny and a cake tester inserted into center comes out with some crumbs attached, about 10 minutes. Let cool completely on a wire rack. Break up brownie into small pieces; transfer to the bowl of an electric mixer fitted with the paddle attachment. With machine on low speed, pour in 1/2 cup + 2 tbsp rum, and mix until crumbs start to come together to form a ball. Shape into 1-inch balls, and roll in sanding sugar to coat (*Marion rolled hers in chocolate sprinkles. It did not disappoint). Transfer to a baking sheet; refrigerate, uncovered, until cold, about 2 hours. Serve chilled or at room temperature.